The heart of the Javari is a compact speaker which transforms into the high-midrange component of XL and XXL floor-standing configurations. A high efficiency Alcone AC 15 textile dome tweeter is paried with a Celestion FTR08-2011D, giving an astoundingly high overall efficiency of 93 dB. Due to its high efficiency the Javari is a lot of fun to use, whether it is controlled by a tube amplifier or the broad dynamic range required for the home cinema. The Javari Top uses a 2nd order crossover (12 dB per octave slope). The frequency response of the speaker is quite linear with a slight peak at 12 kHz at an average sound pressure level of 85 dB (1m). The non-linear distortions above 400 Hz are extremely low and well controlled with just95 dB SPL (1m). The decay spectrum shows almost no irregularities except for a small resonance around 500 Hz. "In a small listening room the Javari Top plays fully satisfactory, even with a small-power SE tube amplifier we had a joyful listening experience - especially when we added the active subwoofer box and the tube amp only had to drive the satellite speaker above 150Hz. This combination seems ideal for people with single-ended amps willing to forget about tube amp purism and wanting to enjoy the superior sound of their electronics without their listening room crammed with huge horns. 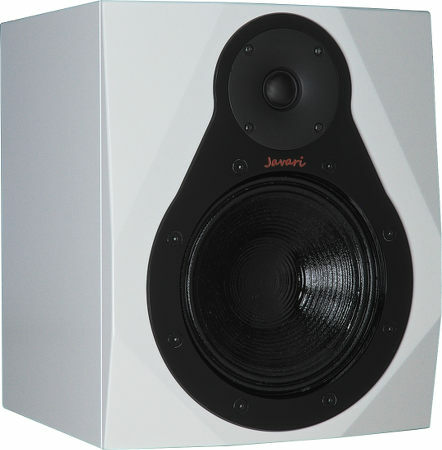 The Javari delivers a well-balanced and relaxed sound impression, only to surprise the listener with their explosive dynamics. The most saturated sound comes from the passive XXL floor-standing Javari – of course driven by a powerful amplifier with sufficient damping factor. For accurately adjusting the active subwoofer you need a sensitive hand - but for critical rooms regarding room modes you can achieve a much more subtle adjustment with the help of an activated bass. Whether you play your music loud or gentle: The Javari floor-standing speaker always delivers a competent impression of a rich sound, great dynamics and precision. Whether your prefer analytic listening or musical pleasure: Javari gives you the choice." "Full upgradeability, full flexibility: You can enter the Javari system by a fair-priced compact class entry and live it up to the fully active high-end floor-standing tower. In their own price segment, all variants show an outstanding quality and the best value for your money - regarding efficiency and sound." If you want to update your Javari Monitor to a floorstander, we offer update kits.